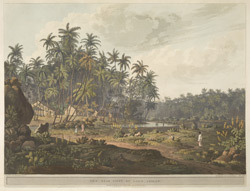 This aquatint is taken from plate 8 of Henry Salt's 'Twenty Four Views in St. Helena, the Cape, India, Ceylon, the Red Sea, Abyssinia and Egypt'. Point de Galle in Ceylon (Sri Lanka) was inferior only to Trincomalee as a harbour. Salt's view was taken "at the spot where ended a canal ... constructed by the Dutch, for the purpose of bringing down from the forests of the interior, those beautiful woods, which form the chief ornament of the cabinet-work of Europe. The groves of Cocoa-nut trees ... add greatly to the beauty of the scene, and form a roof of foliage impervious to the rays of the sun ... The climate of Pointe de Galle is in general good; Ceylon has not the alternate rainy season, like the coast of Malabar and Coromandel; but being situated between them, is at all time liable to occasional showers which cool the air."